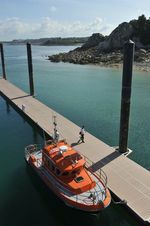 Roscoff Marina is fully provided with essential facilities and services. bars, launderette, chandlery, restaurants, etc. in buildings built to HEQ standards. 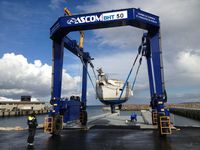 Sheltered wintering, maintenance, repairs, hire, boat sales, storage, tools, and other specialist services will soon be available in buildings in the vicinity. both these areas are equipped with water and electricity supply points. near the harbour office, three bins facilitate the sorting of other waste (glass, recyclable materials & household waste). a short-stay car park can be used free of charge for 30 mins for loading and unloading boats. Roscoff Marina is a member of the Passeport Escales network. The principle is simple: the port offers you overnight berthing in other participating ports, such as Morlaix Marina. In exchange, you declare your periods of absence: your berth can then be rented out to visiting craft. You get the most out of your sailing, and benefit from advantages offered by nautical companies and tourism providers. Since the first of January 2014 Roscoff marina is member of TransEurope Marinas network. The principle of the network : a group of select marinas offering reciprocal visitor discounts to their berth-holders. Member marinas provide cruising Benefits throughout a wide network of International marine destinations. Cardholders boaters receive a discount of 50% off the stops to 5 nights per year and per port when calling another member Transeurope Marinas port.